The Parentalia continued this day, and was a celebratory period in which ancestors were honored. It lasted from February 13 through the 21st. The temples would all be closed during this period. Offerings of small amounts of wine, bread, a sprinkling of salt, or flowers were made at the tombs. Albinus was defeated this day near Lyons in 197 AD, and committed suicide. On this day in 356 AD the emperor Constantius II ordered all pagan temples closed. This act gave tacit approval to the intolerant Christians to begin the persecution of the Religion of Nature, which lasted for centuries. February is a month in which particular reverence was shown to the spirits of deceased ancestors. This was a month devoted to fertility, both of men and women, and of the land, and celebration of the coming Spring. Today is the Birthday of Copernicus, born on Feb. 19, 1473, in Thorn (Torun), Poland. Copernicus was a proponent of the theory that the Sun, and not the Earth, is at rest in the center of the Universe. Copernicus received his education, first at the University of Krakow, and then at various universities in Italy. While attending Padua University in Italy, Copernicus studied medicine, Greek, and mathematical sciences. He eventually received a degree in Canon Law at the University of Ferrara. When Copernicus returned to Poland he practiced medicine, though his official employment was as a canon in the cathedral chapter run by his uncle, the Bishop of Olsztyn. Copernicus was never a professional Astronomer. The great work that made him famous was written in his spare time. It was for friends he met in Rome while pursuing his education that, in about 1513, Copernicus first wrote a short account his heliocentric (sun centered) cosmology. His heliocentric system states that the Sun (not the Earth) is at rest in the center of the Universe, with the other heavenly bodies (planets and stars) revolving around it in circular orbits. A full account of the theory titled, On the Revolutions of the Heavenly Spheres (De Revolutionibus Orbium Coelestium) was published in 1543, very near the end of Copernicus's life. He is said to have received a copy of the printed book on his deathbed. Copernicus' heliocentric system was considered implausible by the vast majority of his contemporaries, and by most astronomers and natural philosophers until the middle of the seventeenth century. Its notable defenders included Johannes Kepler (1571 -1630) and Galileo Galilei (1564 - 1642). Strong theoretical underpinning for the Copernican theory was finally provided by Sir Isaac Newton's theory of universal gravitation (1687). 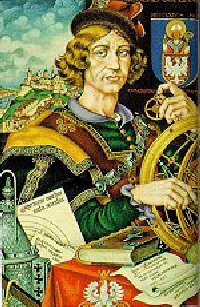 Copernicus died on May 24, 1543 in Frombork, Poland. The Parentalia continued this day, and was a celebratory period in which ancestors were honored. It lasted from February 13 through the 21st. The temples would all be closed during this period. On the sixth day of the Parentalia and beginning of Feralia, offerings are left at the tombs. The souls of the dead are appeased with small gifts brought to the extinguished pyres. The dead value piety more than any costly gift. Such gifts might include a tile wreathed with votive garlands, a sprinkling of corn, a few grains of salt, bread soaked in wine, or some loose violets. These offerings are set on a potsherd in the middle of the road, and prayers and the appropriate words are said at hearths set up for the purpose. From this time until the 21st, Tacita, the silent Goddess (Dea Muta) is honored. She is also called Lara, mother of the Lares. She is asked to bind hostile speech and unfriendly words. This was the 1st day of the 3rd month of the 13 month Druidic calendar. The sequent letter is N, symbolic of the tree Ash (or Nion). Traditionally the time each year when plans are developed in secret, alliances reviewed, assumptions questioned and energies organized toward release a month later, at the beginning of spring. 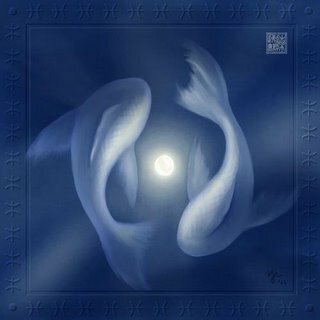 While the Sun is not "in detriment" in Pisces, as he has just been in Aquarius, the watery, deep, mysterious qualities of Pisces are not the most compatible venue for the heat, incandescence and clarity associated with the Sun. The symbolic image for Pisces time is that the Sun is most brilliant when far above the water, much less radiant and impressive when near the water, even in it. It would be simplest just to enjoy the water, but the Sun does not enjoy perceiving this. Do not walk across carpets and touch perfectionists until Aries time in March. Pisces, was assigned by the ancients to the Syrian goddess of Derketo, who the Romans called Dea Syria and the Greeks Atargatis, possibly meaning "Great Fish." In the Celtic Tree Calendar, Ash Month begins. In some accounts this month is considered the most sacred of all because it honors Yggdrasil, the World Ash Tree, the universal principle of Balance. Ash month is favorable for breaking of curses and building of new protection. Ash wands are cut and prepared as conduits of energy. In some native American calendars, the Month of the Cougar begins on this day. In the Zoroastrian calendar of ancient Persia, this day is Spentra Armaitri, one of the year's great festivals honoring the quiet strength and nurturing power of women. The Roman counterpart in honor of Tacita, the silent goddess, protectress against the ill effects of unkind speech, is observed on the same day. This day is also the birthday of the beloved teacher, author and Hindu mystic Ramakrishna Paramahansa (1836), who taught the immanence of the elemental Maha Devi, the Great Mother, in all things.